Lodge Barn01263 715779work01603 870304fax Self-cateringThis wonderfully restored barn enjoys an excellent rural location in the beautiful Norfolk countryside. Surrounded by a great selection of walks and paths guests can enjoy trekking across the nearby nature reserve taking in the marvellous scenery. This property retains many original features such as its wooden floors and timber beams and provides a charming and warm aesthetic. Guests can spend their time relaxing here or enjoying some of the great pubs and restaurants of East Anglia. Lodge Barn has been recently and sympathetically converted to provide comfortable and attractive accommodation on one level. Lodge Barn offers weekly bookings starting on Saturday. 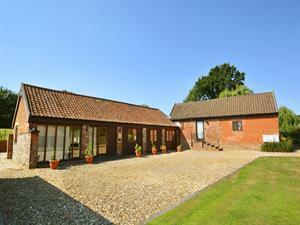 This wonderfully restored barn enjoys an excellent rural location in the beautiful Norfolk countryside. Surrounded by a great selection of walks and paths guests can enjoy trekking across the nearby nature reserve taking in the marvellous scenery. This property retains many original features such as its wooden floors and timber beams and provides a charming and warm aesthetic. Guests can spend their time relaxing here or enjoying some of the great pubs and restaurants of East Anglia.